THIS BLOG IS NO LONGER UPDATED: KAIDIE HAS DIED! KAI HAS MOVED ON! A LIFE 2.0 RE-PRESENTATION OF A LIFE 1.0 SHOW THAT IS ENDING IN A FEW HOURS: Kaidie’s metamap exhibition #6. Where do statues go after they die? Statues die when people stop looking at them (Chris Marker and Alain Resnais, 1953). Kaidie’s metamap is of a less resilient material than bronze, and, like Kaidie, has a prescribed lifespan. It begins dying this evening 17:00hrs, and from 11:00hrs tomorrow (after our morning run), we will remove the papers, tapes, blu tacks, glue dots, marker pen marks, other marks, tracks, traces, bits, pieces, things, remnants, et ceteras. We will paint over the walls and floors where we had been, and leave the space as we found it, as if we had never been there, clearing all paths, as if it had never known existence in the first place (good for it) (for its own good). The work dies from Life 1.0, our primary world, but/and migrates to / returns to / re-starts in Life 2.0, in the virtual and imaginary realm, and exists as if it has done all this while, independent of the one in the physical world. One is not lesser than the other. To be pedantic, the Life 1.0 metamap in the exhibition ‘came from’ Life 2.0 in the ‘first place’, with the 120 maps and images created on the screen, and having previously only existed in Cyberspace. Already, even as it is alive, we are re-creating Life 2.0 re-presentations of it, in a parallel realm. The work is the same work in either lives, but the Life 1.0 ‘version’ also completely differs and is independent of the Life 2.0 one. In fact, there is no ‘essential’ work. When we run restlessly between Life 1.0 and Life 2.0, we are re-creating the/a work again. 2nd row top left: photograph of Kaidie at work by fellow artist-exhibitor, Laura Malacart. Beside that is a sketch by Kaidie of the work, before she began. Middle: Kaidie, quite knackered by now, poses with fellow artists and exhibitors Deborah Padfield and Errol Francis at the end of the humid evening of the opening 25 June. in the next picture, Errol competes with Kaidie for Person With Most Number Of Countable and Accountable Teeth Award 2010. We are fighting neck to neck, shoulder to shoulder, and- of course we are expecting this- teeth to teeth, a tooth for a tooth, gum for gum. Who do you think should win? Bottom right: Pink poster Spillage indicates the title of the show. Bottom left: Kaidie’s hand-made wall text for her new hand-made wall-text-installation, 24 June 2010, 1 day before show opened. The masking tape on the wall were to be all licked up, of course. Kaidie’s Life 3.0 ecosystem tolerates no wastage (most of the time). Check out the ‘paper tippex’ on the right hand side of the wall text as well (since there is no undo button in Life 1.0). LAST 2 DAYS TO CATCH KAIDIE’S FIRST LIFE 1.0 INSTALLATION! Slade Centre of Research, WC1H 0AB. 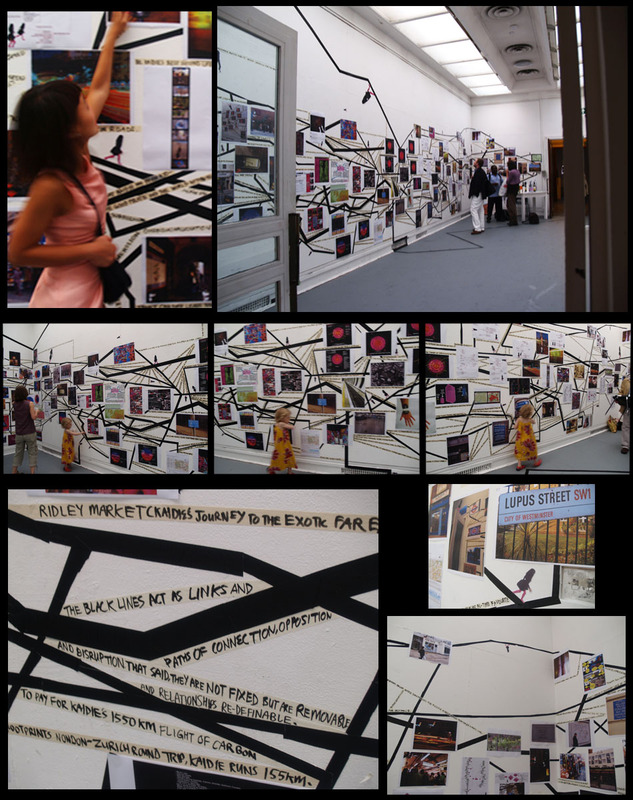 Kaidie’s metamap exhibition #5. 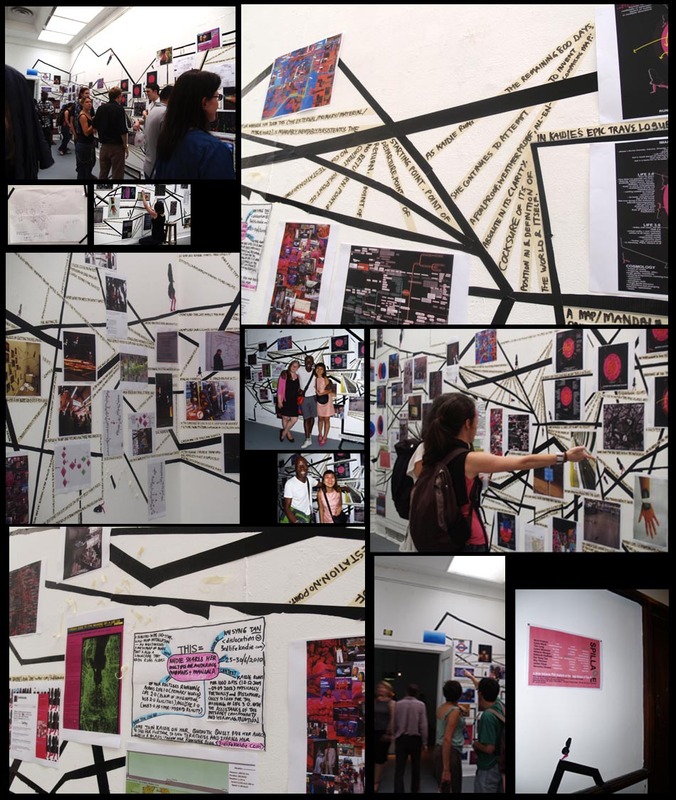 Across a 14m-wide wall, Kaidie works on site across 9 days to create a metamap consisting of 120 maps and images, that attempts to map her transdimensional run. This show departs from Kaidie’s recent works in that it utilises no multimedia, and that Kaidie installed this by herselves, got down on all fours and was all hands-on and filthy, screaming at no assistants except herselves. Slade Centre 25-30 June 2010, Nondon. The baby in the triptych in the middle fingers the trails and links of Kaidie’s wall map – good. Then she goes on to spill red wine and pringles on my floor – no good, but she’s a baby, and we are so magnanimous as to hold no grudges against babies. And then she cries loudly, as if she was the victim! – oh, NO GOOD, but still understandable in the scheme of things (yes we are rational beings). But that is not the punchline – the adults responsible for the tot did no thing to help clean up, and escaped! – NOOO GOOD. My Dear Readers, we are sure that you have encountered ultra-righteous people with a strong sense of entitlement, who act as if they are the only on earth to have ever reproduced (THE REST OF US – if you did not already know – ARE ORPHANS MADE FROM PLAYDOH). So we – speaking as self-righteous runners and figures of imagination – had to stoop on the floor and lick up the pringles+wine+the baby’s tears+dust+hairs (thick, thin, curly, straight, blond, red, brown, black, etc), being ever so keen to store up food and drinks in our system at every opportunity in the middle of the ‘we-are-all-in-this-together’ recession. Image of Kaidie overstretching herself by Alexandra Gomes during private view 25 June 2010 Friday. (Yes – pink, and its shades, was the order of the evening. Why? Because we have for the past few lifetimes tired of the obligatory black attires at art openings.) THANK YOU ALL for coming to the exhibition thus far, and its opening. 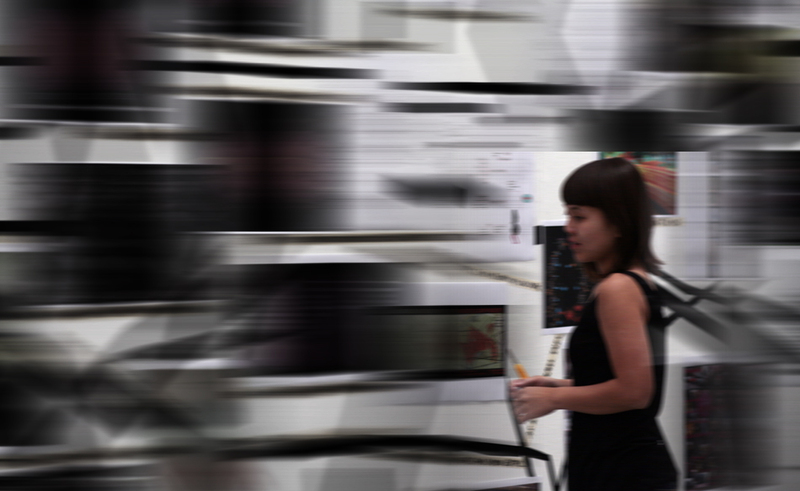 More images of opening and exhibition to come – look out if Kaidie has caught you on camera! Did you say and smell of cheese? So, watch this space. Do not move, for soon all this will disappear from Life 1.0. (We will film ourselves de-installing the work, which had taken 9 full days to install, on Thursday in time lapse, and play it backwards, and upload it on Youtube later. Rather terribly exciting isn’t it). NOTHING COMES FROM NOTHING, AND RUNNING HAS SEVERAL HISTORICAL THREADS. 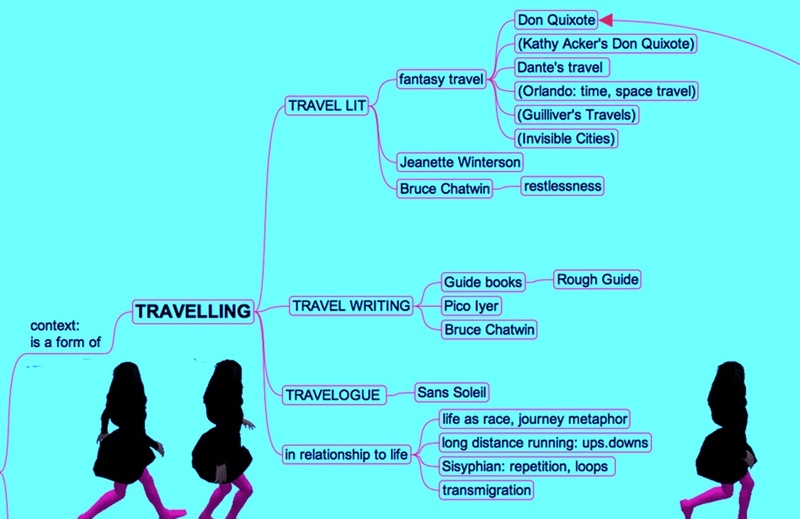 RUNNING CONTEXTUALISED IN THE TRADITION OF TRAVELLING AND TRAVEL LITERATURE. WITH THE INTERNET, KAIDIE HAS MORE RABBIT HOLES TO RUN IN(TO). 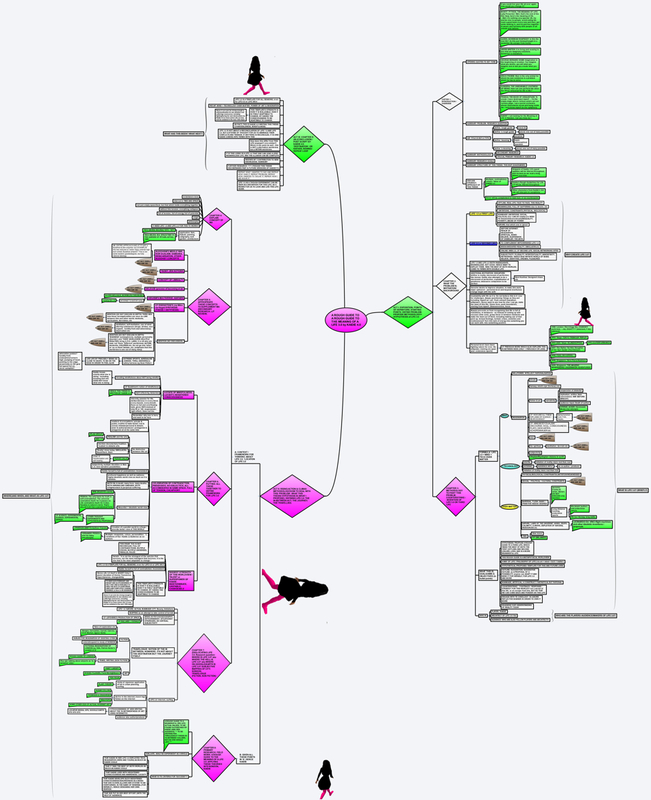 THE 'WHY RUN' MAP IN ITS FULL GLORY. SEE IT (RE-) CONTEXTUALISED IN THE INSTALLATION! Kaidie hard at work, at the Slade Centre of Research at Woburn Square, creating a metamap of 120 maps of her transdimensional run. Beware, however, of Kaidie's knife that she's holding on her hand - she might slash more than paper if you try to come too close. Keep a critical distance! In this show, there is NO multimedia, NO moving images, no cables and no technical cockups, only penknives, masking tape, gaffer tape, 120 pieces of A3 papers, one 25metre wooden creaky scary ladder that Kaidie has to climb up, one lower sturdier ladder, papercuts, marker pens, cups of foamy coffee (we were supposed to have quit coffee!? ), plenty of dust-and-hair (curly, straight, long, short, thick, thin - ALL YIKES!) -collection on Kaidie's jeans as she kneels/prostrates reverently on the dirty floor before her wall, and other analogue goodoldfashioned cockups. Come see for yourself. Original photograph by Laura Malacart 19 June 2010 Nondon, UK. 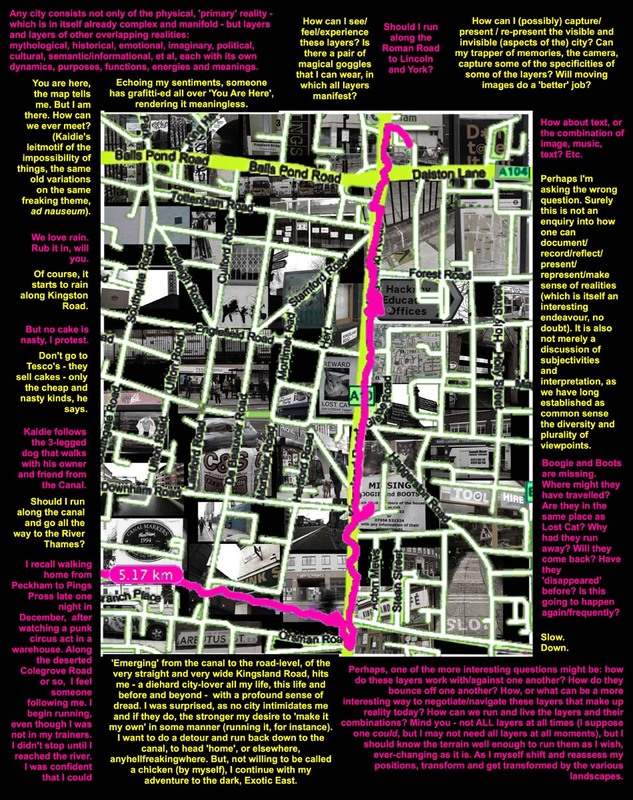 How would a map like this (created before Kaidie's birth in October 2009), be contextualised in Kaidie's wall-installation (June 2010)? Private view: 25 June evening. Exhibition: 25-30 June. Location: Slade Research Centre Nondon WC1H UK. Opening hours: 9am – 5pm daily except Sunday. 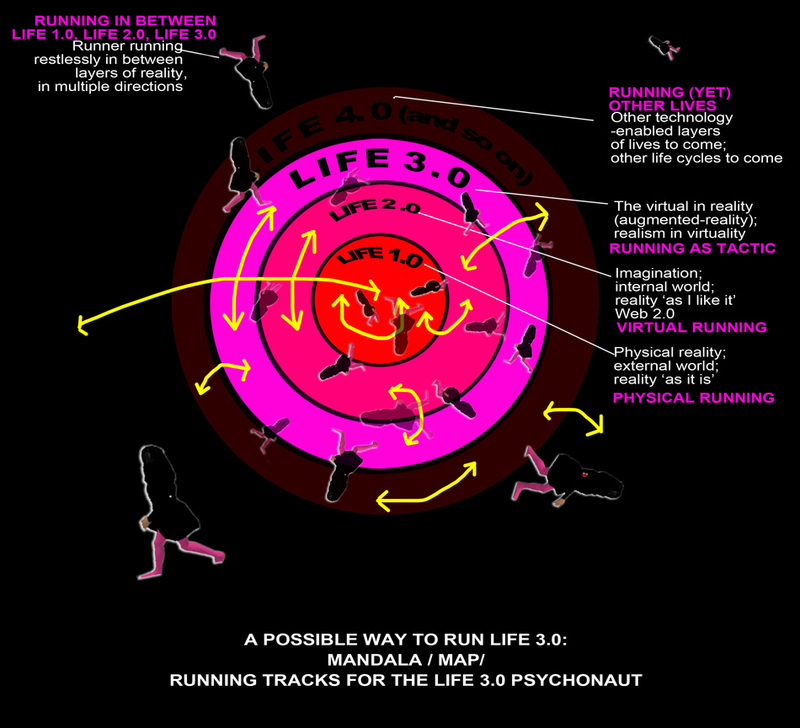 Kaidie exhibits her Multiple Mad Meandering Maps + Mandalas of her restless running across Life 1.0 (primary world), Life 2.0 (realm of imagination, Web 2.0 realities) and Life 3.0 (Web 3.0 AR+MR, hybrid reality). As we speak, Kaidie is creating a 14metre-wall-installation, a metamap of her maps of her intradimensional run. 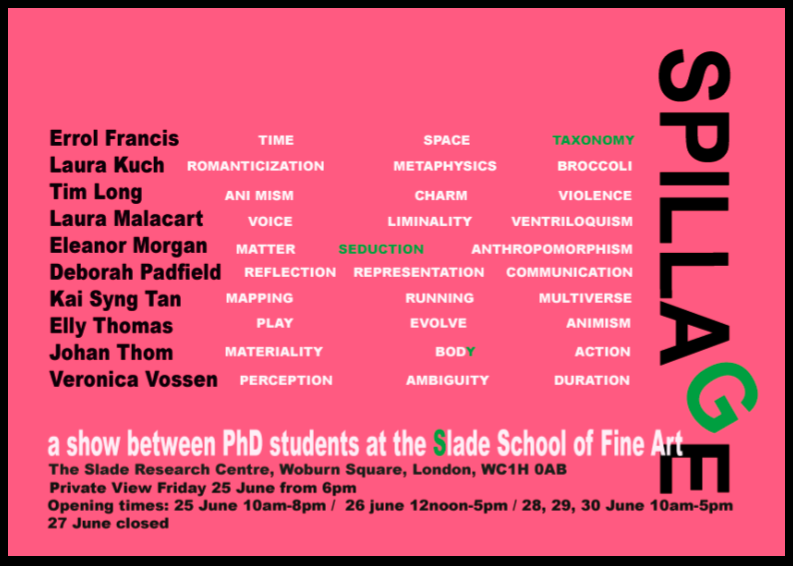 In this exhibition, there are 14 PhD and researchers on show with a wide-range of works including performance, sculpture, video installation and sound. What: In this exhibition, there are 13 PhD and researchers on show with a wide-range of works including performance, sculpture, video installation and sound. Private view: 25 June evening. Exhibition: 25-30 June. Location: Slade Research Centre Nondon WC1H UK. Opening hours: 9am – 5pm daily except Sunday. See you around. Literally. Being all-rounded we can bounce ideas off each other. Jolly well. March 2010: an appropriation of the yin-yang symbol - or/and an appropriation of the pepsi logo. December 2009: picture-perfect simple/simplistic venn diagramme of the in-between. GIVEN THAT THE PREVIOUS POST HAD BEEN EXCEEDINGLY VERBOSE, THIS ONE IS SILENT. 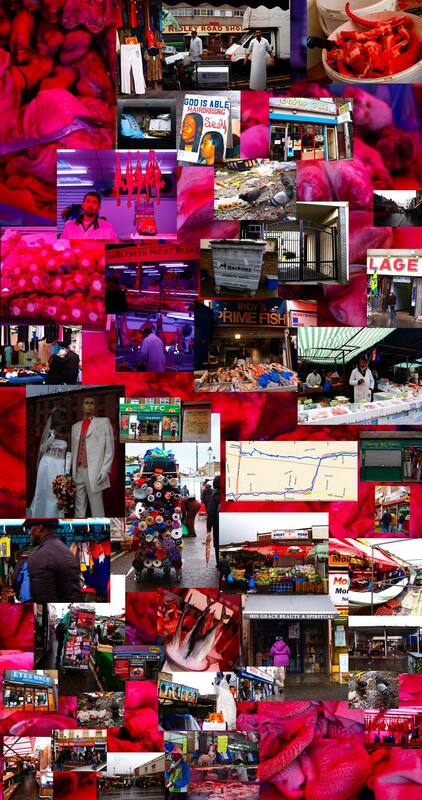 KAIDIE’S ROUGH GUIDE TO THE EXOTIC FAR EAST #5: RIDLEY MARKET. AS I TURN 6-MONTHS OLD, I REALISE THAT I QUITE ENJOY MY LIFE/LIVES NOW, HERE. Unbeknownst to me at that time, my visit to Enjoy Cafe is to turn out to be profoundly life-changing. As I turn 6-months old on 12 June 2010, I wash down a dozen of the Aphrodisiac Sausages with Dettol. I am hit – not suddenly, but gradually, nicely, warmly, largo – with a realisation that I quite enjoy my life and lives now, here, in Nondon, in my Life 3.0. I think, and I know, that I enjoy where/when I am, difficult/diverting/frustrating/frivolous as it is. Society celebrates youth, in all its actual and mythological glory/beauty/recklessness/kawaii-ness/innocence (or so-called). I enjoyed being young when I was, but I also enjoy having travelled the journey (detours included) to get here, of being what(ever it is that) I am now, quite tremendously, in all its imperfections/wisdom (or lack thereof)/scars/histories/wear&tear/warts&all. And I enjoy knowing that I am enjoying it. Mind you, I am by no means old, old, but having lived 6 out of my prescribed 32.8-months allowance declares that I am no spring chicken, but a mature summer barbecued pork, sweating in lard. Dripped from the previous years’ roasts. 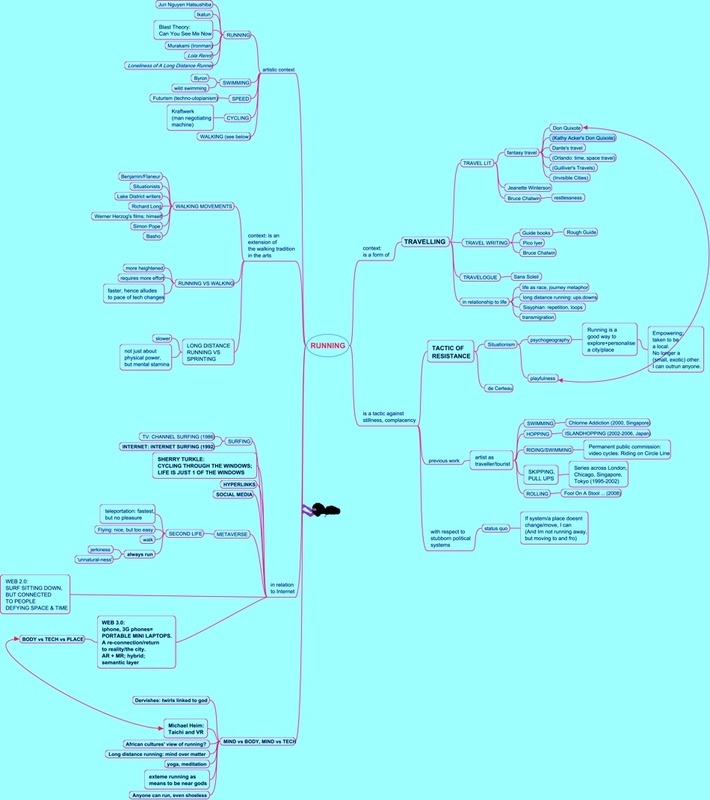 This image has as its source several text-tree diagrammes generated by Dr. Jamie O'Brien from a programme he designed. More than ever before, I now enjoy many things physically, intellectually and psychologically. My Life 3.0 reality is an augmented one, but with neither sillycone nor sentimentalism. The best part is that I enjoy knowing how much I am able to enjoy what I am enjoying. (A sign of smugness perhaps, or an other indication of a profound delusion. Not unike Quixote’s). And this is not a tautological statement (even though we enjoy tautologies and tautologies enjoy us). Though I have always been an introspective person, this seems an other stage of self-awareness and confidence that would have escaped me at an other age. More than ever before, I now know what I want, when I want it, and how to dispense/use/it, at the dosage that works – what specific phrase of a piece of music I wish to listen to, at what volume, for how many number of loops; what particular type of cheese I wish to savour at a particular moment, to be followed by what particular dessert at what dosage; what particular scene of a film I wish to replay in my head, to evoke or force about a particular emotion (and it is invariably a Herzog or Marker or Tarkovsky scene), at what point to wean myself off an obsession, to say ‘Enough!’ and move on; to know the exact demands of a task/race at hand, and pace myself, so that I do not burn out too quickly, so that I stay focused and clear, but allow myself refuelling and treats when the energy levels dip, and then go for a final push, a sprint, a dash, a be-all-end-all exertion, et al. I also enjoy not knowing, and enjoy knowing that I do not know, and enjoy that anticipation, anxiety, excitement, the waiting (Have you read Barthes’ elegant chapter ‘Waiting’, in A Lover’s Discourse? ), the feeling silly, and curiosity. I enjoy doing what I am doing. I enjoy what I am being. I enjoy waking up every morning, excited about confronting my challenges. I enjoy a good challenge, as I always have had all my lives, as they give me a good kick, because I enjoy kicking back, hard. I enjoy wanting something and working hard for it. I enjoy achieving. I enjoy leaving. I enjoy arriving. Most of all I enjoy the process of getting there, even if the arrival is anticlimactic. In fact the arrival will invariably be. I enjoy putting in effort. I would have enjoyed not having to put in any effort, of course, but by now I know how I work, how I have to work, so I do, and I enjoy doing that. I enjoy going to bed at night, having fought the demons, windmills, and myselves and looking forward to the next set of challenges the next day. And the next. I enjoy raising the bar (including raising the Snicker bars into my mouth). I enjoy communicating with my friends in Life 2.0. I enjoy knowing you. I enjoy not knowing you. I enjoy that we may never, and/or may never desire to/need to, meet in Life 1.0. I enjoy that we might have met in Life 1.0, but do not out ourselves, because doing so would spoil everything, your idea of Kaidie, and hers, of you. I enjoy that we meet in Life 2.0. I enjoy that we meet at all. I enjoy that we meet, and share, and run together. I enjoy not knowing the fate/s of Kaidie (except that she must expire 09.09.2012). I enjoy that you play a part in Kaidie’s being. I enjoy being invited to unexpected diversions, as invented by my friends, including you, my Dear Readers, my Collaborators, my Co-creators. I enjoy being Kaidie. 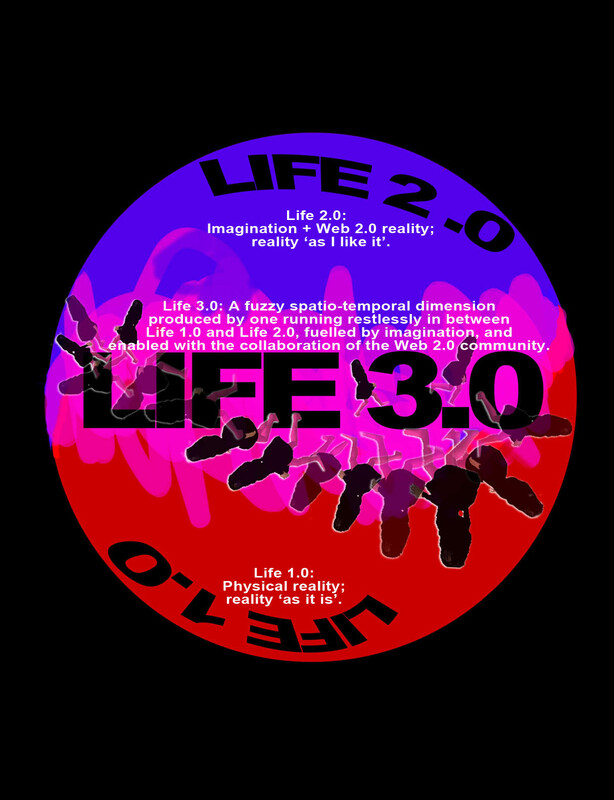 I enjoy that Kaidie and Life 3.0 are public properties, and open source systems, and our collective and subjective imagination. I enjoy trying and testing new things. I enjoy going where I hadn’t/ wouldn’t have. I enjoy running with you. I enjoy having virtual running companions on my 1000-day journey. I enjoy exploring new territories and unknown terrain. I enjoy not knowing. I enjoy being surprised. I enjoy that things are not written. I enjoy that Kaidie can be over written by you. I enjoy that Kaidie can be written off by you, and me, or in spite of me. I enjoy that Kaidie’s story in Life 3.0 cannot be facilitated with out your Web 2.0 assistance and good-old-fashioned imagination. I enjoy that Kaidie is not precious, that she will cease to exist, that she is me, but can be any one, any body, real or imagined, that she is fictive, but that she is me as well, that I am her, that you can be her too. I enjoy the smell of my cocoa-butter moisturiser because it smells like superrich vanilla icecream and I want to eat it but I don’t. I enjoy lying on the grass with B, G, S when the sun is shining. I enjoy walking home from Great Marlborough Street with C, and sighting a deflated football on the street and attempting to kick it, only to laugh at it, as if to mock it, but affectionately and not maliciously. I enjoy walking home with J & A from Smithfields when it is more than 20 degrees. I enjoy walking home with B from St Johns Street. I enjoy tension. I enjoy prolonging tension. I enjoy saying hello to the Hispanic cleaners. I enjoyed walking with B again, looking for food, starving, then stuffing my face with a sandwich that had hummous, and something else, and asking B if there is anything on my face, but unfortunately left with no more time to talk more. I enjoy taking time. I enjoy the luxury of time. I enjoy having a short attention span. I enjoy having the physical and mental stamina to endure long journeys/races/lives. I enjoy the sting of wasabi. I enjoy walking at 18 degrees. I enjoy running at 8-12 degrees. I enjoy running in the gym at 16 degrees, because that is the lowest you can go, but the air is still stale and stuffy. I enjoy my shower at 40 degrees. I enjoy swimming in chlorine at 25 degrees. I enjoy my foamy coffee piping hot. I enjoy walking along Commercial Road with G. I enjoyed walking with S along the canal late at night, when I slipped, because I was not wearing my glasses, and where I would not have walked alone at that hour, but together it was lovely, based on a decade of friendship. I enjoyed wandering around Moscow with I as it snowed and we got lost in the circle line. I enjoyed exploring Perth with J, 2 foreigners and strangers looking for a place to go, with out a map, enjoying being lost, together. I enjoyed walking in Suomenlinna with P in a Summer midnight, when it was still bright, albeit chilly. I enjoyed being submerged in the outdoor onsen, in the mountains, when it was cold and raining, holding an umbrella, pitch black, seeing no thing, but comforted by my friends’ laughter, friends who had brought me here because I was flying off the next day. I enjoyed walking with F in Spore in my previous life, and Paris in my current, even though we have both moved on. I enjoy all my long distance flights. I enjoy not sleeping on my long distance flights. I enjoy flying across timezones, political excuses and economic selfishness. I enjoyed my 7-hour bus ride with A, with out sleep, and the subsequent croissants for breakfast, during which exactly two thousand bits of pastry were busily flaking onto the dirty trashy subway station ground, so instead of eating all 2 croissants A had only 1.2, or thereabouts, I gathered. I enjoy running, flying, swimming and living alone. I still enjoy swimming because the chlorine endorphins kick in surely and quickly. I enjoyed running in Tokyo, Fukuoka, Beppu, Oxford, Spore and Winterthur. I enjoy getting jealous of Kaidie when B tells me that he might prefer to go out with the Life 2.0, virtual Kaidie than the Life 1.0 me. I enjoy the airconditioning in the British Library and Wellcome Institute. I enjoy sweating when working out. I enjoy being underestimated. I enjoy proving myself. I enjoy proving myself wrong. I enjoy learning. I enjoy perfect pitch and hearing. I enjoy being a little short-sighted, so I see things in a slight blur when too far away. I enjoy fuzzy logic. I enjoy ambiguity. I enjoy dry humour. I enjoyed playing the piano for 11 years. I enjoy imagining an other life as a concert pianist. I enjoy walking in Regents Fark with A, not knowing where we were going, if any where, but even if no where, that was fine, as it was, as it is. I enjoyed the warmth of my filmmaker-activist friends in Sderot who were passionate about peace. I enjoyed their sincerity and kindness after I endured endless searches in order to get onto el al opening my bags emptying my hand luggage removing my battery from my laptop showing them my files body searched many times passports flipped endless questions asked. I enjoy imagining Y running in Hyde Park, although not with me. I enjoy the smell of fresh bread. I enjoy eating at least 1 banana daily. I enjoy salmon and brie. I enjoy champagne with pancakes. I enjoy olives and corn and niceness. I enjoy the smell of B’s hair. I enjoy smells. I enjoy smelling. I enjoy the smell of my coconut shampoo. I enjoyed last Thursday aplenty. I enjoyed Tuesday very much too. I enjoy enjoying the moments of enjoyment when they happen. I enjoy not trying to repeat such moments because of my insatiability. I enjoy training myself to not be nostalgic. I enjoy training myself not to be attached. I enjoy separating mind from matter. I enjoyed saying hello to the many little people at the museum, because they remind me of R, E, K, B, K, S, even though I have not met S and she, and K, and E would not recognise/remember me, that I have to start afresh with them when I next meet them, and I do not know when I will next meet them. I enjoy holding a baby or a toddler. I enjoy not being labelled as selfish for my choices, because I think the choice of reproduction is as selfish. I enjoy i-chatting with R, who knows all its functions by the age of 6. I enjoy silence when I am working. I enjoy working in silence, because I have memorised and mis-memorised how Gould does it and it swims in my head, never mind if it is a distortion of distortions of Beethoven and Bach. I enjoy the ability to be silent when with an other, because it says that we do not need to rubbish talk, even though I enjoy talking rubbish to amuse you, and me, but I enjoy being silent when we are together, because it is in silence that we are in an other space and time that we enclose for us, as and when I desire an enclosure/definition. I enjoy sleeping. I enjoy sleeping for 12 hours for a recharge. I enjoyed watching G’s eyeballs widen because I say rubbish. I always enjoy walking along Farrington Road because it is wide and gently sloped and when I walk there I am in a good mood or walking there puts me in a good mood. I enjoy walking at 6.5kmh when it is sunny. I enjoy wanting. I enjoy running the next morning. I enjoy being cooked for. I enjoy sitting at the back of a motorised bike. I think I will enjoy skydiving, bungee jumping, and deepsea diving. And freefalling. I enjoy doing things with no strings attached. I enjoy sleeping at 2200 and walking up at 0500. I enjoy running at 0700. I enjoy a disciplined life. I enjoy letting go. I enjoy being focused. I enjoy being distracted. I enjoy having a sense of control. I enjoy having my routines interrupted. I enjoy drawing lists of things to do. I enjoy drawing lists to remind me to look at my other lists. I enjoy being disrupted. I enjoy pushing myself physically and mentally as a dare to myself. I enjoy surprises. I enjoy being surprised. I enjoy smiling to fellow runners now, when I shied away from it before, but now I do it some times because it is nice when you do laps and encounter the same characters repeatedly, so you smile, and move on. I enjoy smiling and waving back when I run along Euston Road and school girls from the bus smile and wave at me this morning. I enjoyed the 7-second run the man wearing ‘Save The Children’ bright blue t-shirt did with me as I run past Kings Cross yesterday morning. I enjoy running because it calms me down and rids my anxieties, but when A asks, why are you anxious in the first place, I can not answer. I enjoy hearing my heavy breathing as I run, because it reminds me that I am breathing. I enjoy sweating as I run. I enjoy looking forward to food, drinks and not running, when I am running. I enjoy swinging my arms and propelling myself forward as I run. I enjoy running with the minimal things, without water, without ID, with no money, no baggage, no burden, just run. I enjoy running in a city, in any city, because I am no longer seen as an other, no longer small and exotic, but having some temporary ownership of the place I am running, and personalising the space I inhabit, and I gaze the city in a different manner, and I am gazed upon in a different manner, I am even taken to be a local and am asked for directions. I enjoy doing a little bouncy gait this morning, with out pain, with out aches, with some speed. I enjoy watching the blister grow on my toe. I enjoy the texture of chaffed skin from rubbing my arm against my running shirt. I enjoy my running clothes scratching my back, creating marks on my back that do not leave, where as I would have been disturbed by any mark or blemish or spot before, but now I accept some, because it comes with this activity. I enjoy taking time to warm up. I enjoy taking time to stretch. I enjoy fartleks when I feel stronger. I enjoy pounding on the treadmill when I am fully focused, because I have to be careful not to drift, because when I did I fell off. I enjoy hitting 14kmh on the treadmill. I enjoy counting when on the treadmill. I enjoy not counting because I count everything in my life. I enjoy taking calculated risks. I enjoy slow, long-drawn runs when I work at distances. I enjoy running alone in real life. I enjoy testing my limits. I enjoy knowing my limits. I enjoy pushing my limits. I enjoy working with my limits and limitations. I enjoy the prospect of a big bowl of boiled cauliflower/parsnips/broccoli/cougettes after my run. I enjoy that my cheap pink nail polish comes off nearly as soon as I put them on. I always enjoy my 2nd round in the Fark because that is when I am no longer anxious, but simply running, when my head is full of thoughts, and at the same time not thinking of any thing in particular, when my body is most relaxed, and when my GPS will register my faster times, not because I am racing, but because it feels good, and I know now how to make myself feel good by calling upon my running endorphins. I enjoyed a very nice run on Wednesday morning, after a nice Tuesday where no thing and every thing and some thing else happened, when I moved on the next morning, still tired and still light, but running, unthinkingly, and registered my most enjoyable and fastest 2nd round ever in a non-race condition, 10.2kmh, as opposed to my usual 9.4kmh, not terribly much better in real terms, but mentally, in unreal terms, trust me, it felt good, very good, feeling completely free from any pain, any bother, just relaxed, just 1 foot after the other, not minding the branches poking me, not minding other runners zapping past me, but bouncing on/off my shoes, not as if my shoes are super bouncy, for, mind you, it was my old Brooks, 1 out of my 3 pairs of running shoes, but this with the sole /soul soon coming off, but still I felt a bounce, a new gait that I never had before Wednesday, and best of all, I was able to control that and bring it on when I felt ready, and I knew that I felt ready, so I ran, almost bouncing sideways, arms swaying me forward, not minding how funny or ugly or clumsy I must have appeared, but enjoying the lightness of being, momentarily, in perfect control, and complete-total-freaking-fully let go at the same time. I enjoy discipline. I enjoy being a disciplinarian. I enjoy the dictum of no pain no gain. I enjoy Nondon and cannot imagine doing this, whatever it is that I am doing, any where else. I enjoy long distance calls on Skype. I enjoy running across different dimensions. I enjoy being confused about which dimension I am in, and applying different sets of values, sometimes inappropriately. I enjoy forgetting if I should have been more assertive, or am not humble/polite/modest enough, or am too much of a go-getter. I enjoy forgetting if I am not serious enough, if I am too austere, or if I am too childish. I enjoy having a large repertoire of values to pick and mix, and learning new things in each new dimension that I travel to. I enjoy my life and lives now and do not stop me from enjoying myself. I enjoy this intensity, this being filled, this being fulfilled, being empty, a half full/half empty question, being anxious, being lucid, being heightened, having no excessive things in my life, being frivolous and enjoying silly indulgences. I enjoy being reconciled. I also enjoy not being reconciled, being confused, being consistently inconsistent, being torn between violent opposing thoughts, still struggling with the theory vs. practice problem, being exhausted and wrecked by Kaidie, being Kaidie, not being Kaidie, being besides myself, being shipwrecked, being afloat, not moving my arms or legs until the next swimmer comes along and hits me off the lane, tumbling, falling down, stepping on horse poo, huffing and puffing and neighing as I run, running out of breath, holding my breath underwater, being at one and at the same time many, having many conflicting values, and having many contradictory views, having absolutely no values. I will enjoy my Summer. I enjoy staying focused. I will enjoy the next 26.8 months of my life. * 13 July 2010: After this post was published, I read of a nice story that captures perfectly the essence of the word serendipity– of a couple who lived in seperate continents, but who were photographed 30 years earlier, in the same picture, but one of them in a pram, in the background, and a complete stranger, of course. They met 15 years ago, and only made the discovery 8 years ago just before their wedding. This sounds like a classic Kaidie scenario (of some hits and plenty of misses that we have with one another, as we traverse across lifetimes) albeit one that has a happy ending (in so far as a unification is read as a positive thing, and if endings are desirable). Hello world. We are Kaidie, a trans-dimensional runner. We look for The/A Meaning of Life 3.0, by running for 1000 days across Life 1.0 (the primary world — including the city that we live in, Nondon, UK), Life 2.0 (the realm of imagination, as well as realities made possible by Web 2.0), Life 3.0 (the hybrid, mixed and augmented realities made possible by Web 3.0) as well as Life 4.0 (‘Web 4.0? and other future technologically-enabled realities, as well as other cycles of our lives to come, in the form of transmigration). Would you give us a hand on our quixotic quest? Whether we succeed or not, we must die on the last day of the Nondon Olympics, so hurry! 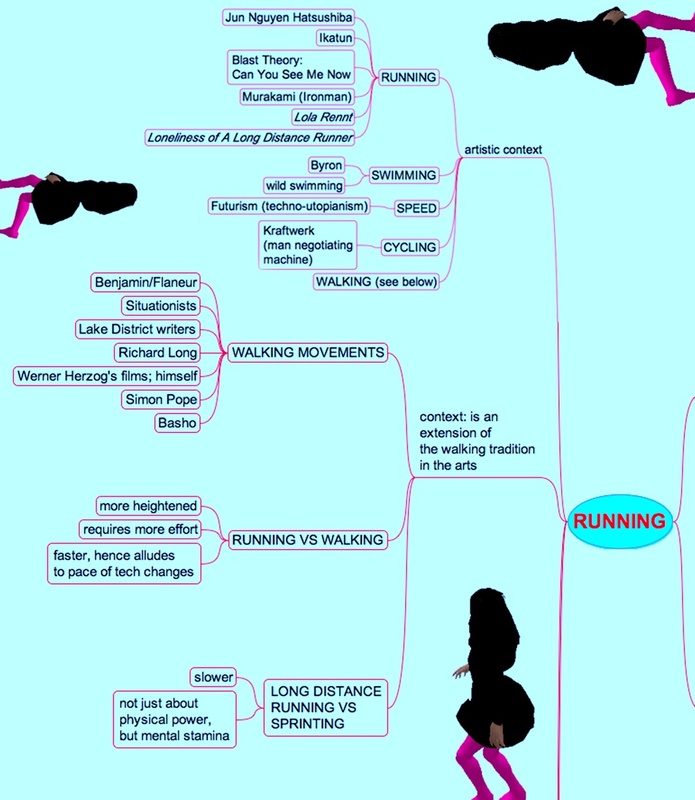 Be our running buddy, write in, share with us ideas/images/sounds/thoughts. Let us take us for a heavenly hell of a rollercoaster ride of our lifetime(s) – come with us, go for it, live this Life as if the last, it is now or never, let go, trust us, believe us, we dare you. Let us have the best run of our Lives, every Life. One cosmology of this multiverse. Kaidie’s mandala/map/running tracks as of June 2010. The work of artist/art curator/art educator Kai Syng Tan has been shown in more than 45 cities (Guangzhou Triennale, Biennale of Sydney, ICA London, Yamagata Internetional Documentary Film Festival). Kai Syng has won several awards (SFIFF merit award, Young Artist Award, Most Promising Young Artist Award aged 18), residencies (NIFCA, Japan Foundation) and grants. She is an advisor in a panel at the Media Development Authority of Singapore. For 7 years she was also a digital arts consultant and film lecturer, and ran a Video Art degree programme in an art university. Trained in Tokyo (MA in Fine Art, Excellence Award, Distinctions, top student, Musashino Art University), Chicago (School of Art Institute) and London (BA in Fine Art, 1st class Honours, top student, Slade School of Fine Art) on full scholarships, Kai Syng is currently a PhD researcher at the Slade School of Fine Art on scholarships from University College London and the National Arts Council of Singapore. Kai Syng’s interdisciplinary work (performance, cine-essay, installation, text et al) examines the notion of ‘reality.’ In one of her previous lives, she had done this by viewing the world through a self-reflexive video camera of a restless tourist/traveller and had been named ‘one of Singapore’s foremost video artists’ (Dr Eugene TAN, 2007, in Contemporary Art In Singapore. Eds NADARARAJAN G, STORER, R. & TAN, E. Institute of Contemporary Arts. Singapore. 142.) Her current research, A Rough Guide To The Meaning of A Life 3.0: Kaidie’s Transdimensional 1000-day Run 12.12.2009 – 09.09.2012, is conducted as part of her PhD research at the Slade School of Fine Art, University College London, UK. 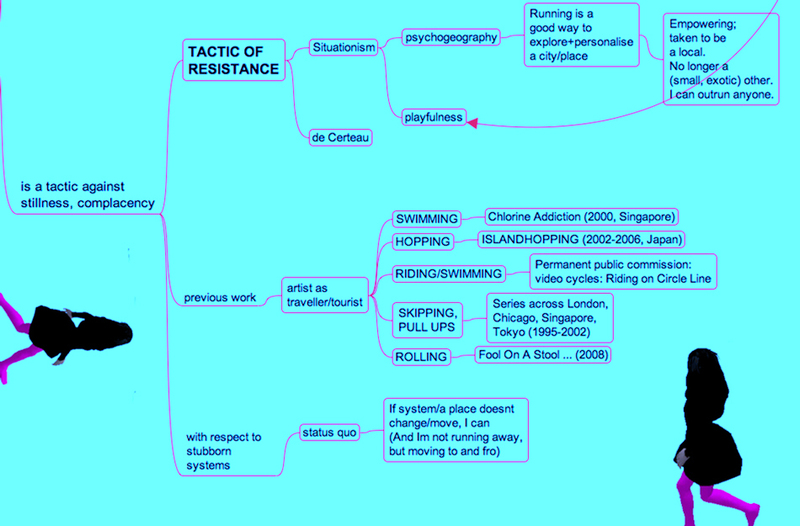 Kai Syng’s written thesis, entitled (Trans-dimensional) Running for Our Lives! A Rough Guide, proposes the critical strategy of trans-dimensional running as a means of navigation and negotiation of our 21st century multiverse. Kai Syng’s studies are funded on scholarships from the University College London and the National Arts Council of Singapore. EVERYDAY ENJOYMENT WITH SPECIAL SAUSAGES in Little Britain in 25 steps: KAIDIE’S ROUGH GUIDE TO THE EXOTIC FAR EAST #4. WHAT DOES TIME MEAN FOR SOMEONE WHO EXISTS ONLY FOR 1000 DAYS? Urbantick interviews Kaidie. Urbantick: How does time pass in relation to your life of 1000 days? Urbantick: Your life is constrained to 1000 days. How does 1000 days feel? The limitation probably is even more obvious compared to something that lasts longer. What do you measure the passage of your life against? You are talking about living life to the limit, experienceing it intense and running. Is there a slow and a fast time? 3rdlifekaidie: 1000 days is both tortuosly long and terribly short. What could be accomplished in 1000 days? For Kaidie, she has to find the Meaning of Life 3.0 (with)in/before time runs out. Is 1000 days long enough for that? Or is it too thinned out? Traveling around the world in 80 days seem like a ride of a lifetime; 800 or 8000 days is still not feel sufficient for one to heal the wound of a dead memory; 1 day is 1 too many to go cold turkey on an addiction/obsession/obscure object of desire; every minute of every single day is a new discovery, a new beginning for a baby. Running 42km for 5 hours seems a little preposterous; ‘hanging out’ with a loved one for the same duration seems too short, as one always yearns (futilely) to ‘spend the rest of one’s life’ with an other. Kaidie rejects any notion of eternity and permanence (if there is one thing that is remotely ‘forever’, it is the notion of changeableness). Instead, Kaidie plunges into the moment of the now/here, and lives like all tommorow’s parties (and funerals) are right now. As Kaidie traverses between the real and virtual worlds, she measures her time against the calender in real life. Taking the cue from one of her favourite performance artists Teh-Ching Hsieh and his 1-year performances, Kaidie cannot cut her hair for 1000 days. Well, most of her hair. It would be rather unbecoming to appear excessively Neanderthal, would it not. Urbantick: Is it important to be on time? Looking back, how have you come to this position and what is your background? What is you strongest time experience? 3rdlifekaidie: Of course it is important to be on time – especially given that Kaidie has such a short lifespan of all of 1000 days only. Not to add that it is incredibly rude to keep someone else waiting – unless one intends to offend the other party, in which case it works rather well. One of Kaidie’s stronger time experiences so far was when she took part in the 10km charity run for the Friends of Medecins Sans Frontieres. She split up the workload with her Facebook friend, Kailives, and managed to complete the race in half her usual time. Another instance was when she was advised by her reader to ‘look for love’ in her Life 3.0. Being so short of time, she went on a speeddating session. However, she found nothing. Maybe such things need more time? Perhaps she will learn in time to come. Urbantick: The clock time is everywhere on planet earth different, how would you describe the current time of the planet globally? In a rather global sense, how would you define time? 3rdlifekaidie: Time is process, journey, running, goes on, does not stop, goes on in spite of, change, memory, experience, imagination, fantasy, learning, not learning, wounds, healing, not healing, life goes on, in spite of. Urbantick: I always presumed the virtual world to be a replication of the real world. You are spending a lot of time in the virtual world. Can you explain what the terms ‘space and ‘time’ mean in life 2.0? Are you using a specific definition of time in each of the worlds, and if so how do you translate it? 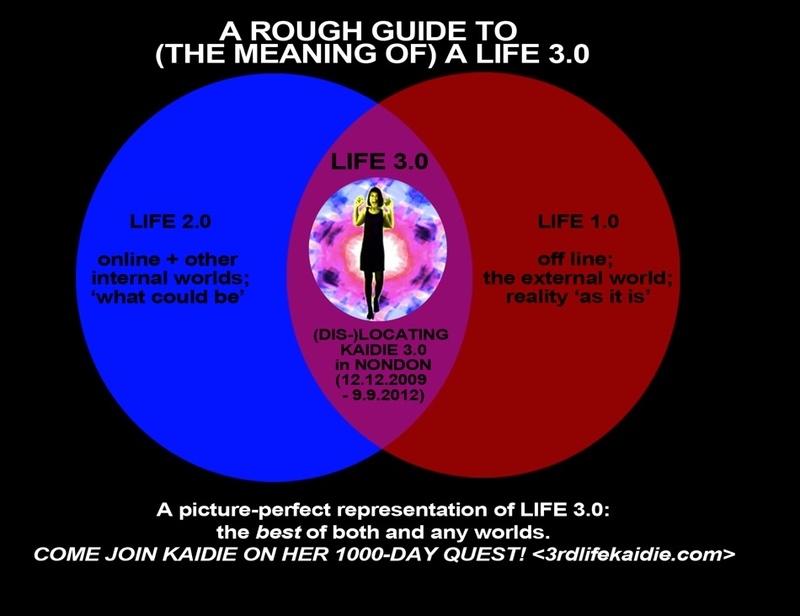 3rdlifekaidie: Where Kaidie is, in Life 3.0. 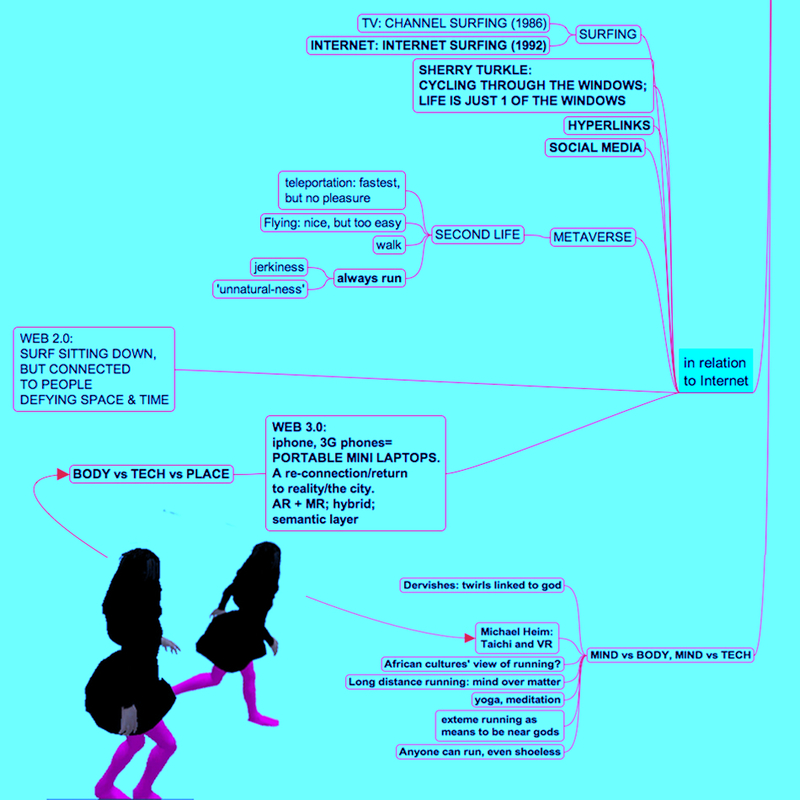 Life 3.0 is the tactic of the dérive in the ma (in between) of Life 1.0 and Life 2.0. It occurs in a dimension in which space and time are ‘mutually responsive’, in a ‘chaotic, mixed condition’. Cyberspace, one of the components of Life 2.0 in the discussion, is itself an unstable and still-untamed site. The ‘nonspace of the mind’ [vi] is a site of ‘consensual hallucination’. [vii] It is also ‘the ether that lies inside and occupies the in-betweens of all the computers’[viii]. Superimposing the notion of dérive to that of ma as ‘space between’ [ix], ‘time between’[x] and space-time-between[xi] Life 1.0 and Life 2.0, Life 3.0 is the restless travelling in between space, travelling in between time, as well as travelling in between the space and time between space and time. Urbantick: At work you run, well you are running all the time, how do you relate to time while you run? Is there a backup system if the timing fails? 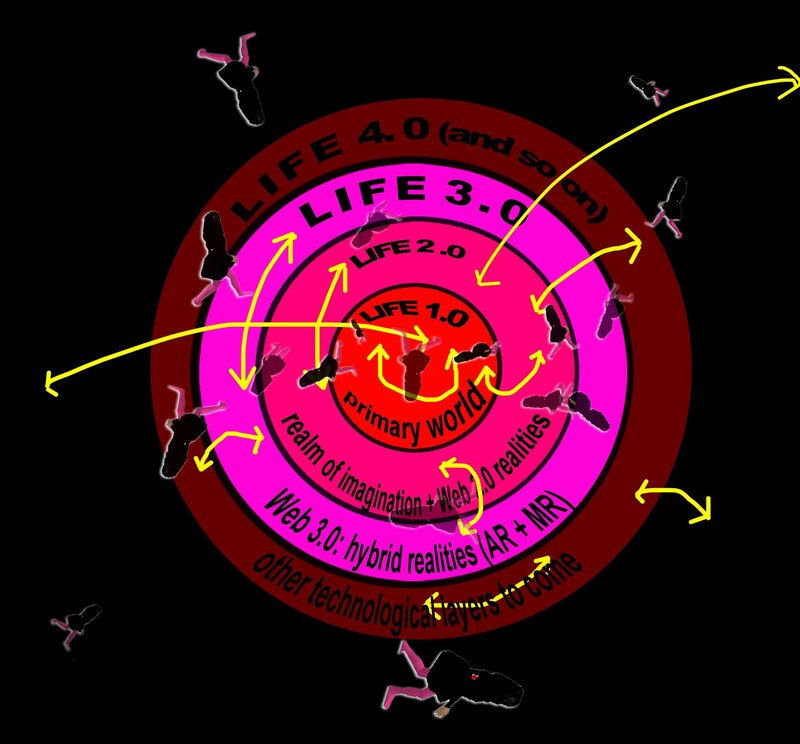 3rdlifekaidie: Rather than a static condition, Life 3.0 is a verb of action, of restless running in between Life 1.0 (physical reality) and Life 2.0 (realm of imagination, and Web 2.0). Kaidie runs, albeit slowly, as her race is a marathon of her life journey. Any marathon is a test of one’s physical as well as mental stamina. In any long-distance run, there are ups and downs. Kaidie gets her fair share of ‘runner’s highs’. When this happens, time (and space) are not of any consequence. However, when Kaidie hits the walls, or runs with blisters and aches, time slows down, or even comes to a standstill. In times like these, there is nothing Kaidie can do except to plough through, run through the problem and face it head on, conquer it, learn from it, and then move on. And on. Fabian Neuhaus is a PhD researcher at the Centre for Advanced Spatial Analysis. His main research interests are temporal aspects of the urban environment and cyclical, repetitive temporal patterns specifically. He has been teaching at the University of Plymouth as well as the Bartlett School of Architecture. For his MSc in urban design at the Bartlett School of Architecture he was awarded a distinction. Fabian also received a MArch from FHNW Basel, Switzerland. He has worked with architecture and urban design practices, and universities, in Switzerland, Germany and the UK. [i] Isozaki, Arata, and Ken Tadashi Oshima, Arata Isozaki (Phaidon Press, 2009), p. 157. [ii]Daniel Charles, ‘Bringing The Ryoan-Ji To The Screen’, Taka Iimura homepage <http://www.takaiimura.com/review/DC.html>, accessed 21 November 2009. [iii] Pilgrim, Richard B., ‘Intervals (“Ma”) in Space and Time: Foundations for a Religio-Aesthetic Paradigm in Japan.’ History of Religions 25, no. 3, February 1986, p. 255. [iv] Isozaki and Oshima, 157. [vi] William Gibson, Neuromancer, new edition, Voyager, 1995. [viii] Sardar Z. & Ravetz J.R., 1995. From Martin Dodge, ‘Cybergeography’, Environment and Planning B: Planning and Design 28(1) 1-2, 2001 <http://www.envplan.com/abstract.cgi?id=b2801ed>, accessed 4 January 2010. 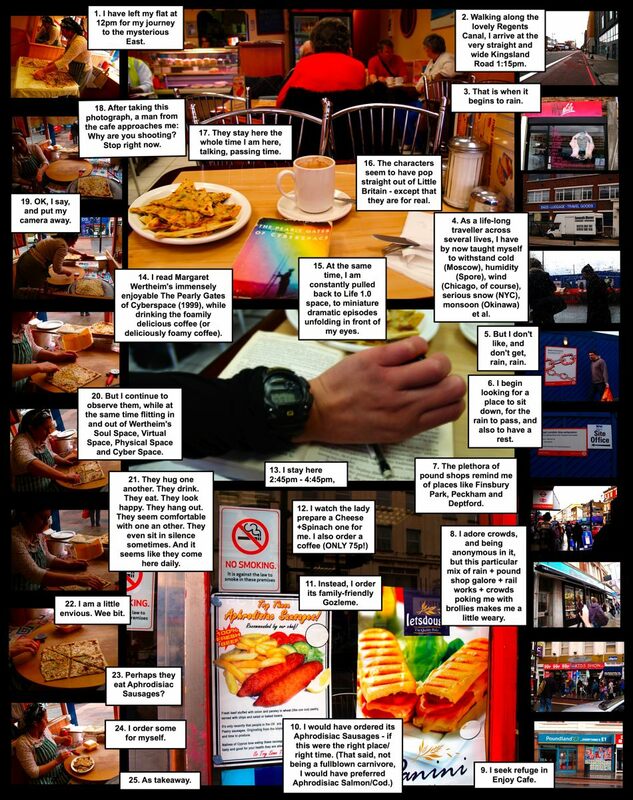 THE INVISIBLE (LAYERS OF THE) CITY: KAIDIE’S ROUGH GUIDE TO THE EXOTIC FAR EAST #3. Erratum: ‘I was confident that I could …’ on the left hand corner here at the bottom should read ‘I was confident that I could outrun this person/any one, not because I run fast (Dear Readers, we have been there before, several times), but because I knew that if I kept going, stubbornly, silli-ly, I would, eventually. So I did.’ This sentence should alternatively say, ‘I was confident that I would not run ahead of my bloody sentences and would finish them the next time before I publish anything’. There you/I go. The 1000-days that has been WAAAY overrun, has FINALLY finished its run (fun fun and fun run run). For now.